Have you ever wondered how Rivercross compares to Clear Path, Serenity, Progressive, Compassion, and Sunflower hospice when it comes to Google? First thing you need to realize that when people are searching for hospice care, they don’t always use those exact words. 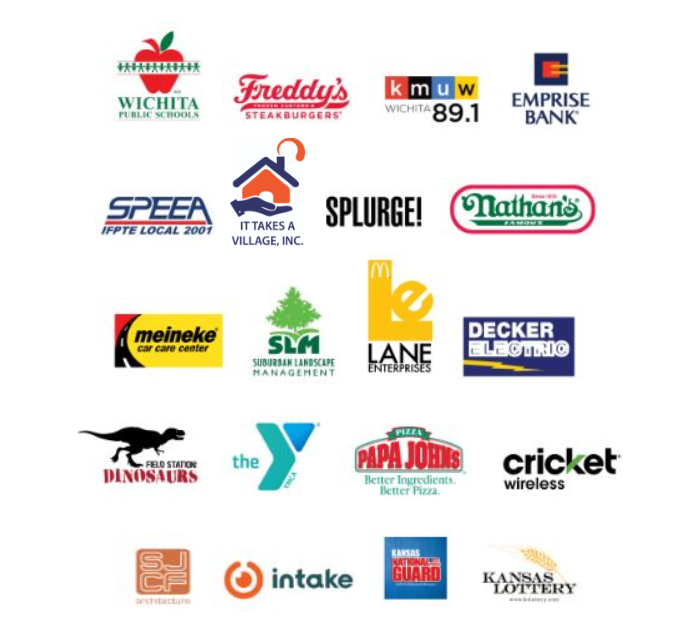 In fact, I’ve tracked down the most common search words and phrases – these are the keywords people are searching for thousands of times each month just in Wichita! VISIBILITY: When these words & phrases are searched, Rivercross Hospice’s site is seen 0.64% of the time, that’s only 1 time in 156 searches. AVG. POSITION: You are NOT showing up on the first page of results in most of these searches which is a real problem since hardly anyone searches beyond the first page of results. You are, on average, the 18th hospice link to show up. TRAFFIC: Your website has received 1300 clicks from these searches. Imagine how many more visits to your site and more leads you will get by improving your visibility and position. Your competitors are in as bad, or worse, shape regarding visibility. The reason why it is so low is that none of these sites have the online content needed to show up high in these searches. 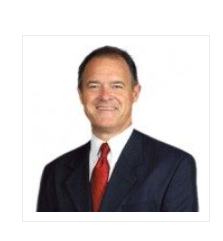 You are getting pushed aside by the likes of Harry Hynes, Amedisys and Encompass. Your average position on Google amongst your closest competitors is nearly the best, only slightly behind Sunflower. While you are still showing up mostly on the 2nd page, you are doing light years better than Compassion and Clear Path. So how do you get Rivercross to show up on the first page of Google searches? This guide will break down exactly HOW to get you there! We are going to touch on 10 CRITICAL areas and how you stack up in each of them. 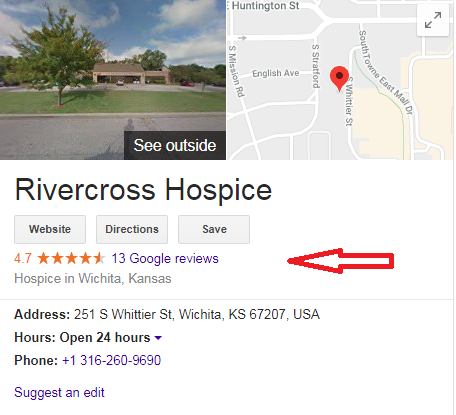 When somebody finds Rivercross Hospice on Google, the red box below is often the “face” of your business. 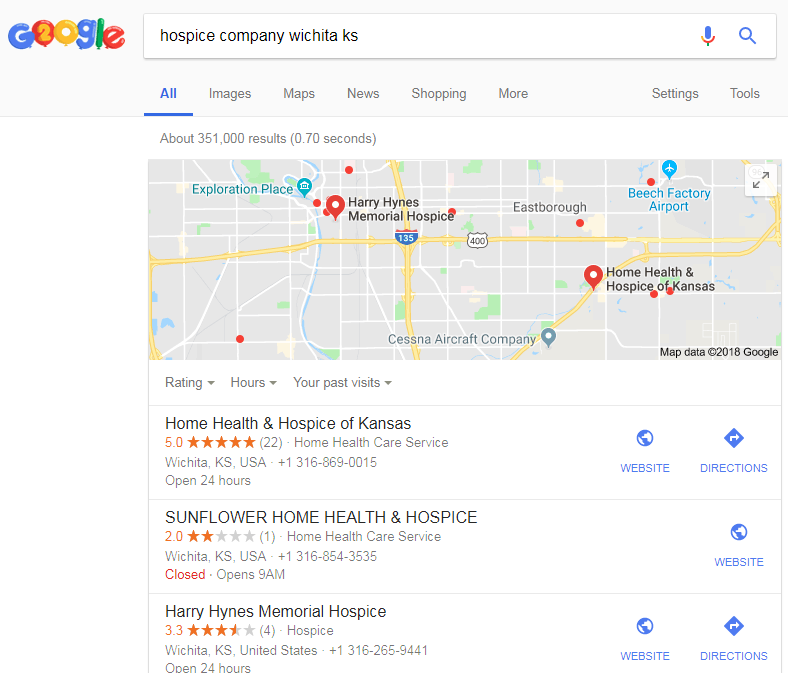 While the current photo on your Google profile isn’t “bad,” with your long history in Kansas and Oklahoma, I am sure we could be doing a better job of capturing WHY Google and, most importantly, people should be considering Rivercross Hospice as their number one choice for local hospice care! 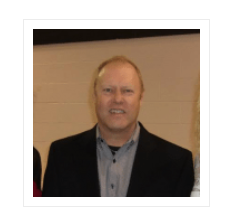 So what does a good Google profile look like? 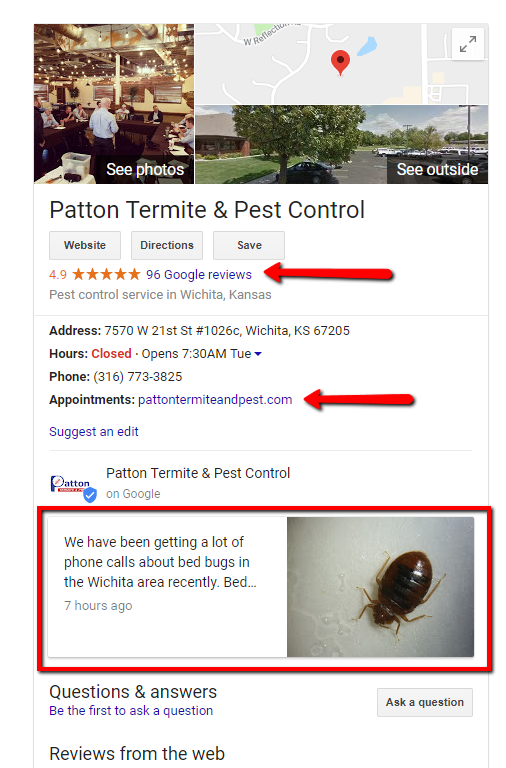 Here is an excellent example of the Google profile for Patton Termite and Pest right here in Wichita. I am sure you would agree these photos really help to show off their history, their connection to Wichita and their BIG team of people who all have a great deal of experience at killing pests! This section will be specific to them and I will do myself. The Rivercross website has a lot going for it but it’s missing ‘heart’ the behind-the-scenes story that makes Rivercross a great place to work and do business with. Almost without fail, the highest viewed page of our clients’ websites is their ABOUT page. People want to do business with people they can relate to, people with experience who are good at what they do and will care. I struck out to find several REALLY good examples of hospice facilities showing their actual team, a positive culture, teamwork, spirit, pride in what they do and I was really surprised how hard I had to look. 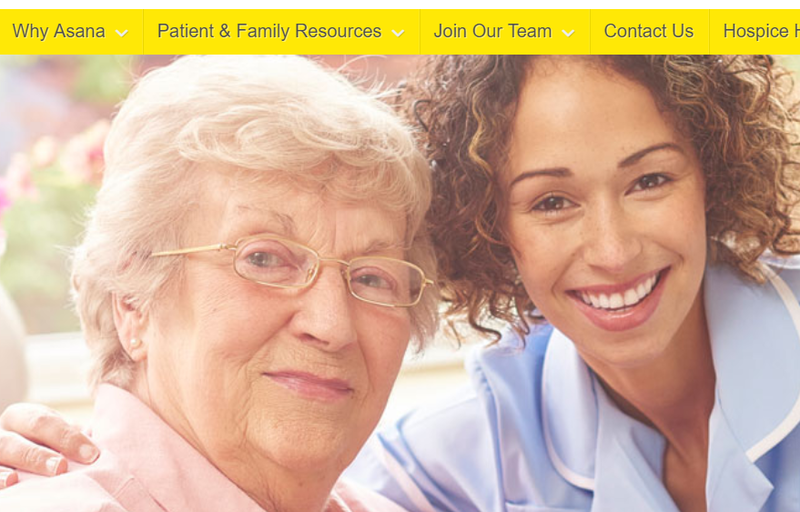 I came across dozens of Hospice websites that were pretty much all cold, impersonal and full of stock photos. So which hospice which is doing it right? and patients and some amazing videos of their location and service! 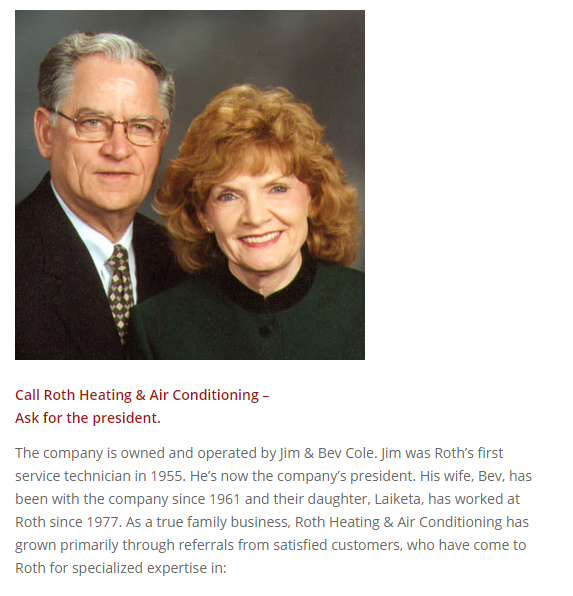 This website is WORKING for them. 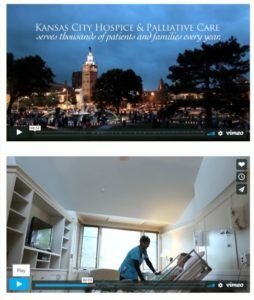 The proof is that it’s ranking pretty consistently #1 for hospice in KC! The great impact and success of using actual images and telling your business’s real stories can not be understated. I have seen for myself with the companies I have worked with – HVAC, plumbers, body shops, pest control companies, dentists, etc. 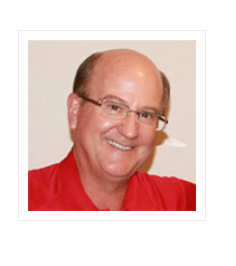 – have ALL seen measurable impact by putting a face to their business. To us, a website is a tool that should be accomplishing several things. Help Google understand who you are, where you are, and why you deserve to be at the top. Customers are becoming increasingly reliant on reviews before making a buying decision. Reviews are a ranking factor to Google, which means they can impact the amount of traffic a website receives and, ultimately, how many phone calls you receive. You also have a total 13 reviews on Google. It is an extremely important (fundamental) key to ranking well on Google. Remember, it’s a game of TRUST. Google needs to trust that Rivercross Hospice is VERY good at hospice and related services. This STARTS with making sure that your name, address and phone number are on EVERY page of your website – especially the contact page. Currently your addresses are not on your homepage or the contact page of your site. 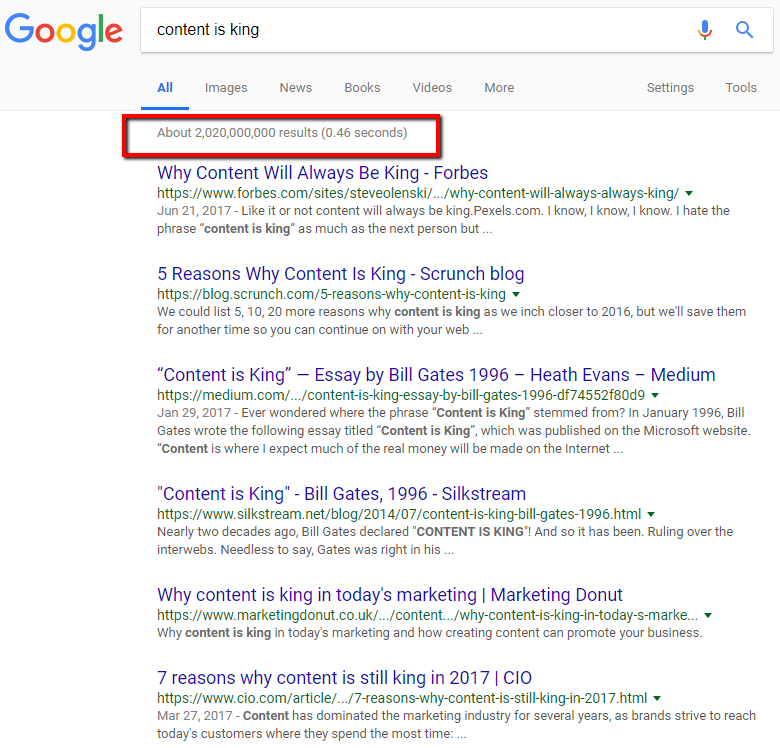 Good content is the answer to people finding you among all the different ways they are searching for the service you provide. If our mission is to be #1 on Google, then it’s vital that the content on your website (text, images, videos) references who you serve, what you do, and why you are great. In your case, if you look at the sample list of keywords at the top of this guide there is a LOT of searches for ‘the difference between hospice and palliative care.’ There is clearly a lot of confusion around this and that means it’s a great opportunity for you! The first hospice facility that creates useful content around this subject will start coming up #1 for this type of search! Let’s say Rivercross Hospice sponsored an event for Riverfest this coming year. You also donated some money to Thunder Hockey in exchange for a banner and your name being announced between innings, and you also said something great about Matthew (the guy who created this case study). 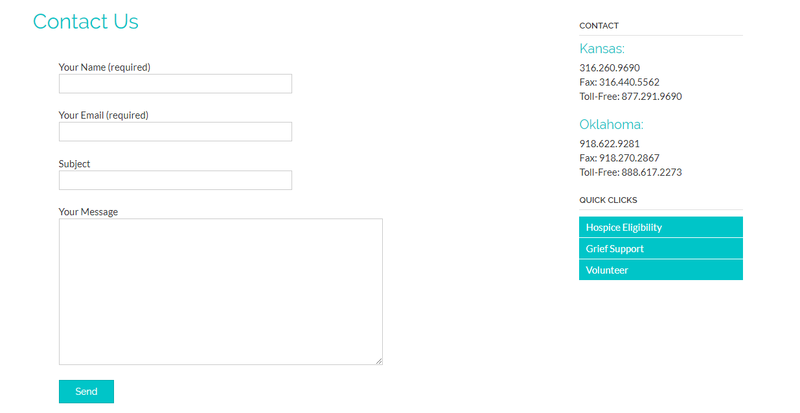 DR is your “domain rating,” or how strong and authoritative the rivercrosshospice.com domain is. Your score of 5 lets us know that something’s preventing your website from having any trust. This could be toxic links from other websites pointing to your site, or technical issues preventing Google from crawling your site. 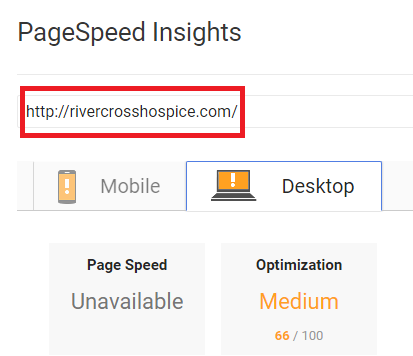 Backlinks refers to how many times other websites point to the rivercrosshospice.com domain. Figuring out WHY your DR (domain rating) is so low would be my top priority. That alone could be costing you hundreds of visits every month. To summarize, from this small sample of hospice service providers, Serenity is doing the best with Domain Ratings while you are about neck-and-neck with Progressive for having the best results with Backlinks, albeit still not many. This is a MASSIVE opportunity for one hospice company, and I guarantee it would pay off BIG TIME. Backlinks is the single MOST powerful ranking factor there is! Currently, Rivercross Hospice has a citation score of 36/100. This is how many citations through the top directories are complete and accurate. A powerful Call to Action is important because it allows us to measure what percentage of your visitors are going to the contact page. How many are going past the first page? How many are looking at your photos or your resources? 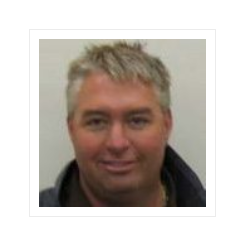 Google profile – Your profile is claimed but there are only two photos. 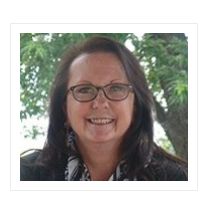 Website – I was surprised to see how uncommon it is to see real people, culture, history across dozens of hospice websites. This is a huge opportunity! Site speed – This is definitely impacting your rankings and traffic. Google penalizes websites that load very slowly. This is very often an easy fix. 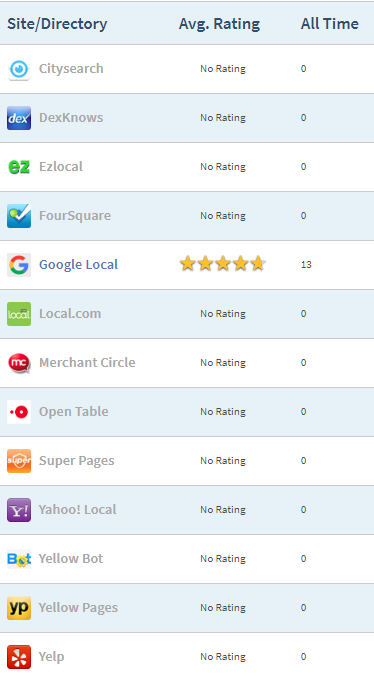 Reviews – 13 reviews on Google isn’t bad but we would love to show you a few ways to multiply this number. 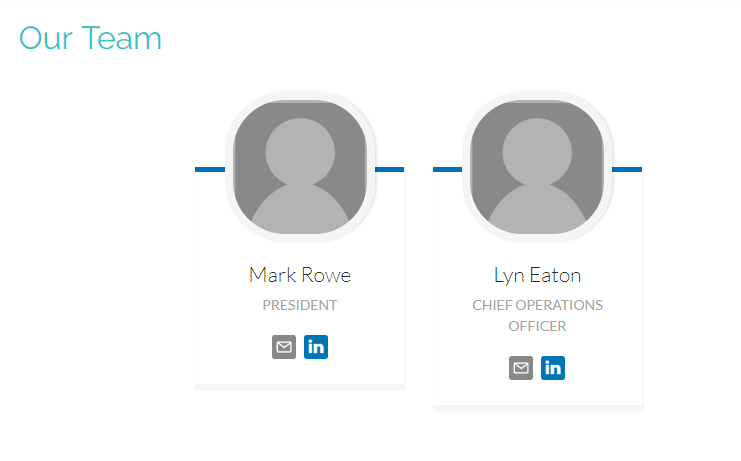 NAP – Getting your name, address, and phone listed consistently across the web is important. 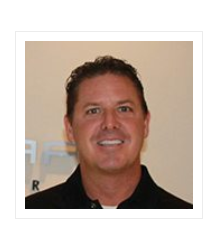 Of course, this starts with having it featured prominently on your website. Citations – These build trust and make it easy for Google to see who you are, where you are, what you do and that you are good at it. Your score of 36/100 is a red flag for sure! Call to Action – It’s down the list of priorities but yes, an enticing call to action on your website would be a great idea! The potential to increase your online visibility, rankings, website traffic and make your phone ring is tremendous. Search Engine Optimization (SEO) is all about TRUST. We need to make it easy for Google to see why Rivercross is the best hospice facility in all of the Midwest! Back in 2010, I owned a local service business right here in Wichita. I hired several companies to help us come up high on Google, but I might as well have been throwing my money out the window. I got fed up and spent months figuring out how to do it myself. 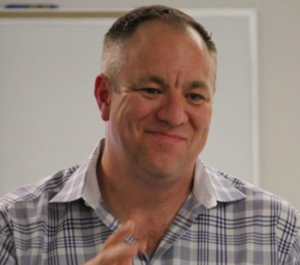 I applied what I learned to my business’s website and managed to increase our sales by almost 40% a year for the next 3 years in a row – while spending less and less on “traditional” advertising. That led to helping a couple of friends and eventually getting out of the party rental business and into helping local service businesses, like yours, make the phone ring. Today, I run an exclusive agency in Wichita. I say exclusive because we only work with clients we are a great fit with and we only work with 15 clients at a time. Our clients aren’t just a number to us. 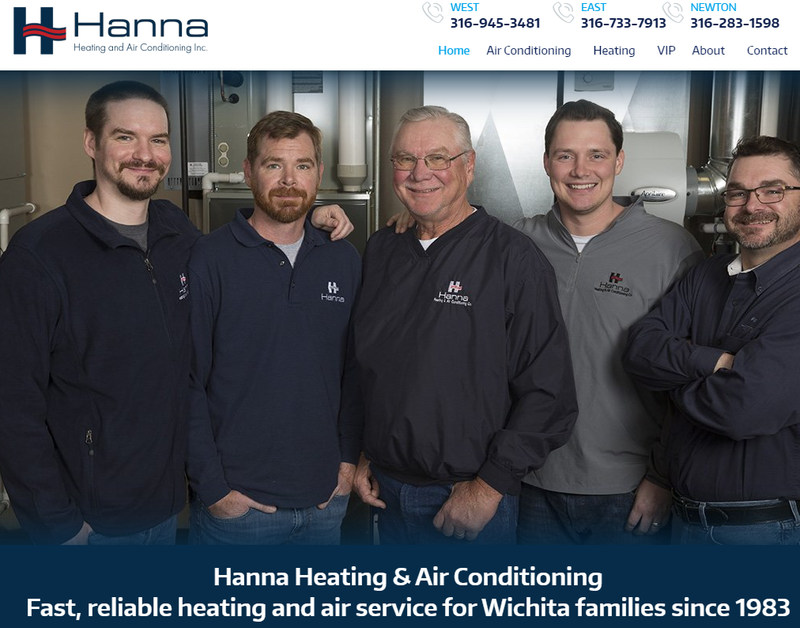 A few of the companies we’ve worked with include Autocraft, Fenix Heating & Air, Patton Termite & Pest, Cambridge Family Dentistry, Treescapes, Hanna Heating and Cooling, US Logo, Overhead Garage Door, Decker Electric, and Trinity Rental. We only work with 15 clients at a time and are very selective. We don’t do cookie cutter solutions or surface work. We dig deep and make things happen for our clients.